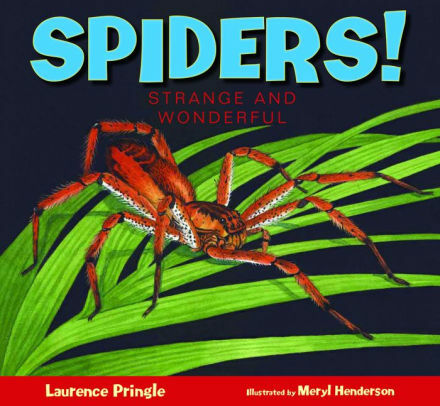 Laurence Pringle is the author of Spiders! 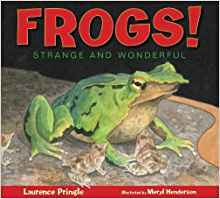 : Strange and Wonderful, a new book for kids. 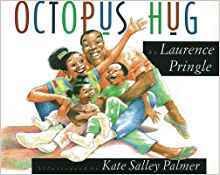 His many other books include Octopus Hug and Frogs! : Strange and Wonderful. Q: Why did you decide to write this book about spiders? A: Spiders! is another in a series (subtitle: strange and wonderful), and I've particularly chosen some animals that people feel are dangerous, or even "bad." That includes books about bats, sharks, snakes, scorpions, octopuses, and alligators and crocodiles. Solid factual information about such creatures can help replace fear with fascination. I like to believe that some readers will look at spiders in a new way, appreciate them, want to learn more about them, and maybe have a favorite kind of spider. A: My research centered on books and articles in scientific journals and magazines written by actual spider researchers. This included items from Science, and Natural History. I also looked through about 10 children's books about spiders, but not for information. Instead, my goal was to look for ways to make my book different from, and--I hope--better than, titles already published. Though I did not do it with this book, my research often leads me to contact an animal expert, to pin down some details. And, of course, I nominated a couple of spider experts to my editor. She chose one, who found a few items to correct in both my text and the art. This is a vital step, since I am fully confident I sometimes get things wrong. Much of the fun of being a nonfiction writer is the research--turning your curiosity loose on a subject and making delightful discoveries to share with readers. I always learn something new. For example, I've long been intrigued with those wagon wheel-shaped orb webs, and learned more about their builders and construction. Also, I gained a new appreciation for jumping spiders. Such faces, such antics! Q: Were you ever afraid of spiders, and what would you say to kids who fear them? A: Fortunately, my parents and other adults in my early life did not teach me to fear spiders. However, I remember one childhood spider experience that was really scary. I was walking through a field in late summer, where the goldenrod and aster plants were taller than me. In this "jungle" I walked right into the orb web of a black and yellow argiope (called the golden garden spider). Yikes! It was a stout web and a big spider. For a split second I felt trapped in the web. I suppose this experience could have made me a lifelong arachnophobe, but in school and later in college (and life) I learned more about spiders. So many of our fears are born in ignorance--and maintained by ignorance. I urge people who fear spiders to give them a chance. The last two paragraphs of my book tell of an Australian woman who had nightmares about spiders, but she cautiously began to observe some through the glass of a kitchen window. She saw them spinning webs, and catching insects to eat. When a bird came by and ate every one, she was upset. She was rooting for "her" spiders! My spider book is dedicated to my daughter Rebecca, who as a child somehow became quite fearful of spiders. But, step by step, by watching them, learning about them, she has become more spider-friendly. The dedication concludes: "She sees the best in people, dogs, and cats, and may someday see the best in spiders." 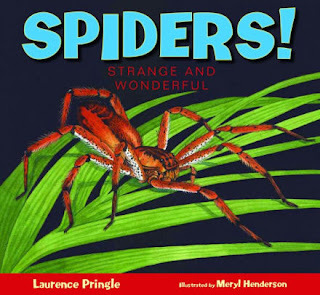 A: I hope readers of this book will take a cue from an early sentence: "Your spider companions just want to go on with their quiet, amazing lives." I hope they learn that spiders are almost all harmless, incredibly diverse, fascinating animals. 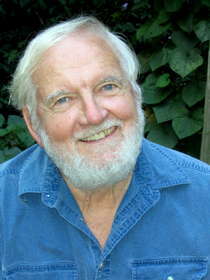 A: After the publication of Spiders!, I have five other books "in the works." All will be illustrated by artists, and that work hasn't even started with three titles. One is a biography. Two are in the animal "strange and wonderful" series, two are in the "secret life" series. I especially enjoy the latter, since these books are aimed at younger readers, and are narrative nonfiction. So far the nonfiction stories have been about Bella (a woolly bear caterpillar) and Vixen (a female red fox). Readers can look forward to Otis (a little brown bat), and a skunk mother and her kits. Artist Kate Garchinsky, who did such extraordinary work in The Secret Life of the Red Fox, has campaigned to work on a book about a puffin. I'm tempted by a loon, a flying squirrel, a bumblebee, even a feral cat! The challenge, as usual, is to convince editors that a subject has good sales potential. The project I'm actually working on is for older kids, and is about animal intelligence. The research is fascinating; so much has been learned, so much still needs to be learned. And what is "intelligence" anyway, and how can we measure it, and compare the "smarts" of one kind of animal with another kind? Dolphins, ravens, apes all exhibit intelligence we recognize, but what about those brainy chickens? As usual, I'm learning a lot, and aim to convey my own excitement and fascination to readers.